Upgrade your paintball experience and win the game! There are paintball games, and then there are Delta Force paintball games! 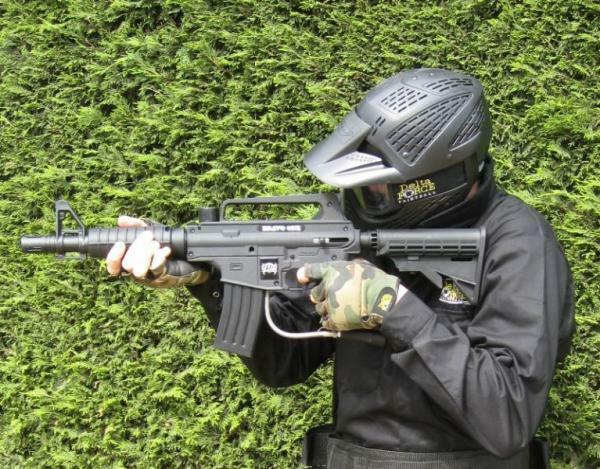 Here at Delta Force Paintball we are always looking to provide the most awe-inspiring and adventurous days out for all our customers whether you are a regular or a rookie – and what a better way to give your team a head start in winning than by upgrading your gun for the day to an M16 Tactical Assault Rifle! Now in stock at all our UK Delta Force centres anyone can become an elite member of our ‘upgrade club’ by renting the infamous Tippmann Bravo One, but be warned you’ll need to get to the centres early as these ever popular guns are on offer to paintball fans of all ages and are available on a first come, first serve basis. But remember, they aren’t the only things to keep you pumped throughout your adrenalin fuelled day, with an M16 in your hands you can expect to play on any number of our movie set quality game zones, from Tropic Thunder to The Battle of Stalingrad. With over 22 years experience at the forefront of the paintball industry, Delta Force provides the ultimate experience for all customers. The M16 is just another addition to our arsenal, why not come share it with us?